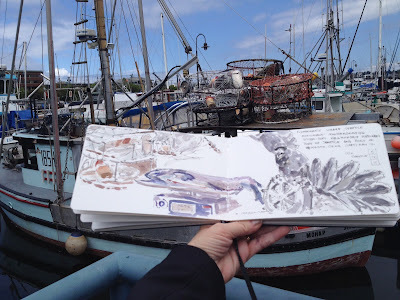 Friday morning started out a bit cold and nippy at the Fishermen's Terminal with overcast skies for the Ad Hoc meeting of Seattle Urban Sketchers today. 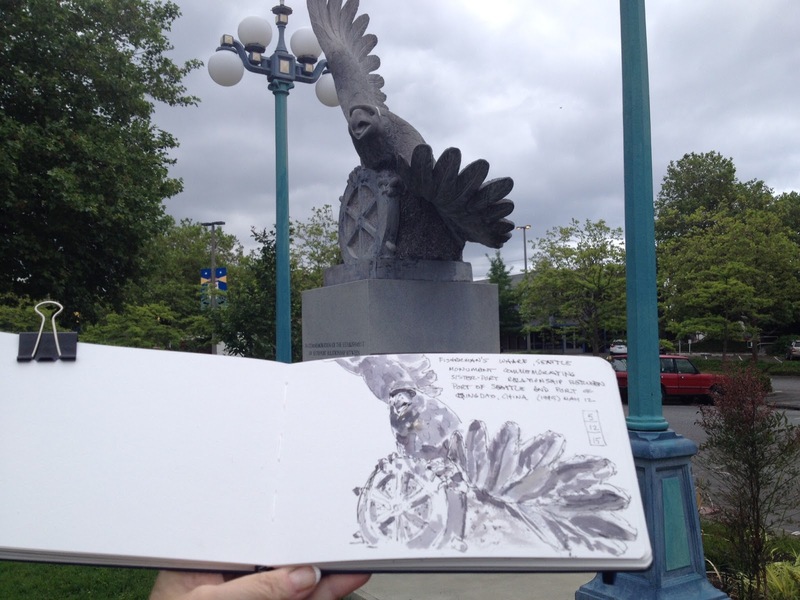 I started out with the stone Qingdao Eagle monument on the west end of the dock. By now, my nose, ears and fingertips were becoming a bit cold for comfort, so I walked around to the south side of the nearby building. 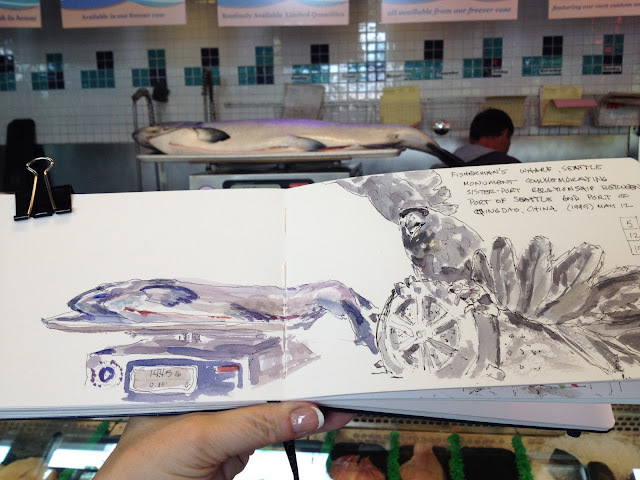 Options for sketching indoors resulted in my choice of Wild Salmon Seafood Market. 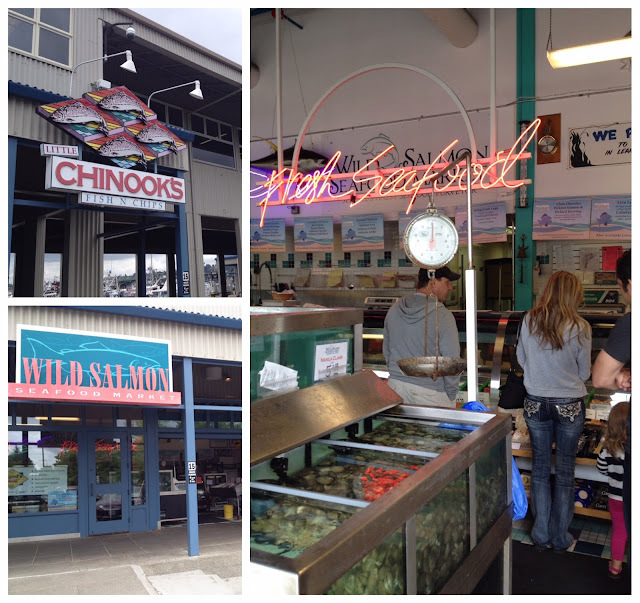 The sandwich board outside advertised the fresh selection of the day: Trout, Halibut, Black Cod, Tuna, Swordfish and Petrale Sole. Lavender light from an overhead sign beckoned me over to the scales atop the counter. Overflowing a tray on the scales was a beautiful fresh King Salmon weighing 14.45 pounds. 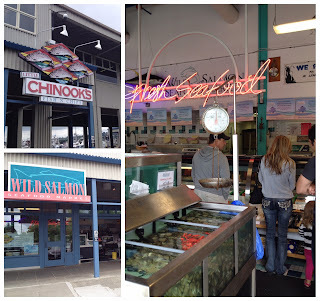 Workers behind the counter told me that it was fresh caught from our Pacific NW coast. They were kind enough to leave it there long enough for me to sketch it. I may have gotten carried away with the lavender lighting, though. 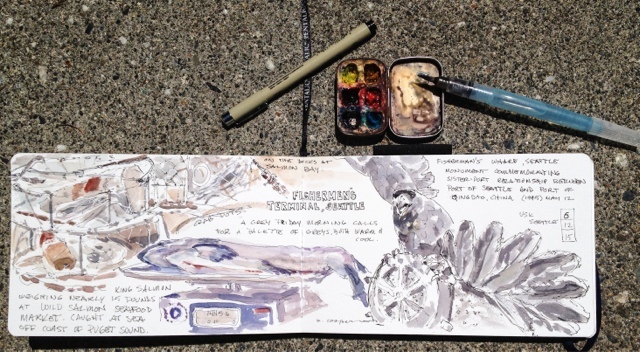 Now that I was warmed up a bit, I moved back outside to continue my counterclockwise circuit. I had enough time for one more sketch. 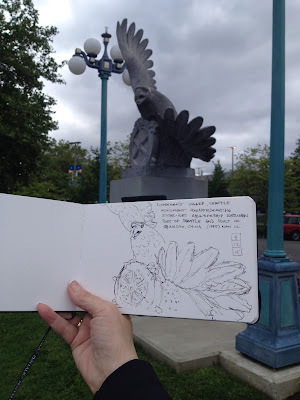 It was a grey day, so I looked for one more subject with a subdued color palette. The crab traps piled high on the nearest boat fit the criteria. 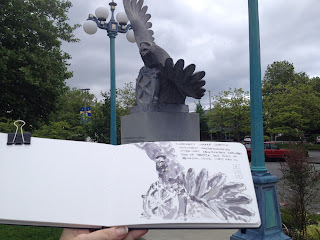 By the time my sketch was finished, the sky had cleared up, the sun was out and it was time to share our sketches. 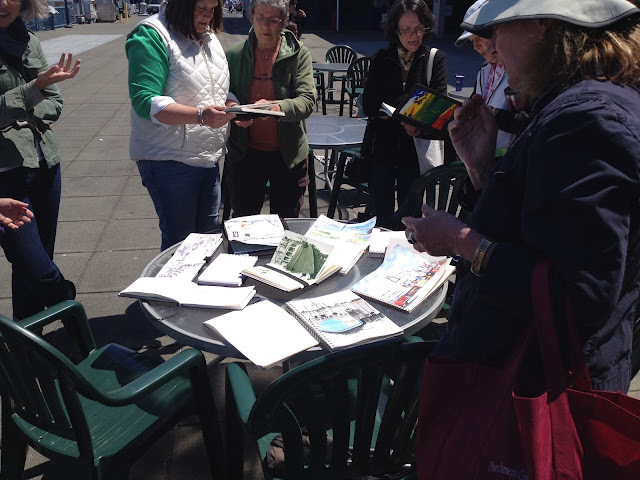 A lively discussion while sharing our sketches in the sun.